In terms of metric performance, gaming apps are light years ahead of non-gaming apps; gaming marketers tend to be more tech-savvy and data-driven, allowing their apps to thrive. However, before an app can perform, it must first be created and accepted by its potential audience. 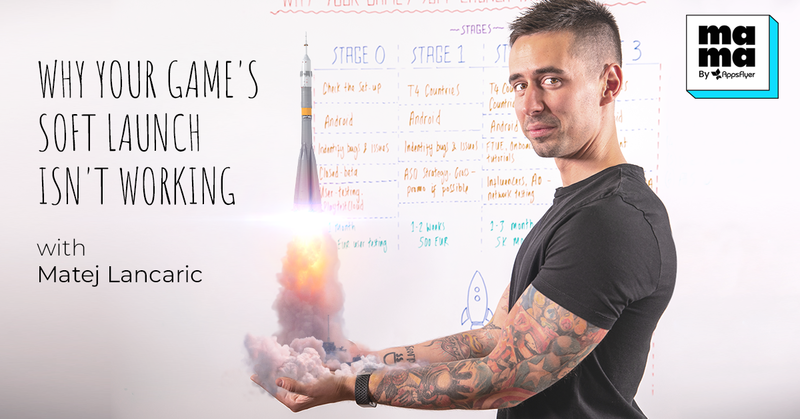 Matej covers the basics of the successful gaming soft launch, including the core setup, best and worst practices, and practical tips to wrap it all up. Hello, everyone. Welcome to another edition of MAMA Boards by AppsFlyer. My name is Matej Lancaric, and I work as head of mobile marketing at Pixel Federation. Pixel Federation was founded in 2007 and is a gaming studio based in Slovakia. We have four live games with over 50 million downloads. Today, I’m going to speak about soft launch and why your game’s soft launch isn’t working. What is soft launch and why do you need it? What is soft launch and why do we need it? Soft launch is a period of time prior to global launch when your game is available in a couple of countries. Soft launch allows you to collect data, identify bugs, and gather player feedback. Also, it allows you to A/B test tutorials, optimize first-time user experience, and improve the onboarding process of your players. During soft launch, you also should test the server infrastructure to be sure you can handle the load of the global launch. A successful soft launch is the best way to optimize your game for global launch, as well as an opportunity to test your creatives and marketing channels. At the end of the day, you should achieve a LTV, or Lifetime Value, bigger than your CPIs, or Cost Per Install. If that’s a yes, then you can go to the global launch. If no, you should think about what can you do with the game, or how much money you have left in your bank account. From there, make a decision whether or not to kill the game. What do I need to do before starting my soft launch? Before we get going, there are a couple of things you should do prior to soft launch. First, you should do market research to identify opportunities. For example, define the genre, whether it’s action or strategy, or define the target audience. There’s a difference between making a game for a male 40+ or a female 40+. Additionally, and my favorite, you should do the theme testing, and test the visuals for your games. For example, we tested cartoon style versus realistic style, and then picked the best performing one for our game. Second, before we get going, you should think about soft launch strategy. You should pick countries for your soft launch game, and you should think about device and credit card penetration. Also, if your game is in English, you should think about English-speaking countries. Besides these considerations, you need to think about Android versus iOS. For me personally, it’s Android first all the time because of the iteration process on Android. It takes two hours to get your build live on Android, but it takes two days minimum on iOS. So let’s think about it. Okay, as the third and last pre-soft launch preparation, let’s talk about analytics as well. You should set up tracking correctly – meaning all your SDKs are in place, all media sources are configured, and all events are enabled in your attribution platform – so that you are able to collect data, and then work with your analysts to define the KPIs – for example, retention on day one, day seven, and day 28, and payment behavior as well. As part of your analytics prep, you should set up good communication channels between the marketing team, game analysts, and game designers, like we did in our soft launches before. We found that it’s really crucial to have close communication between all these different departments. 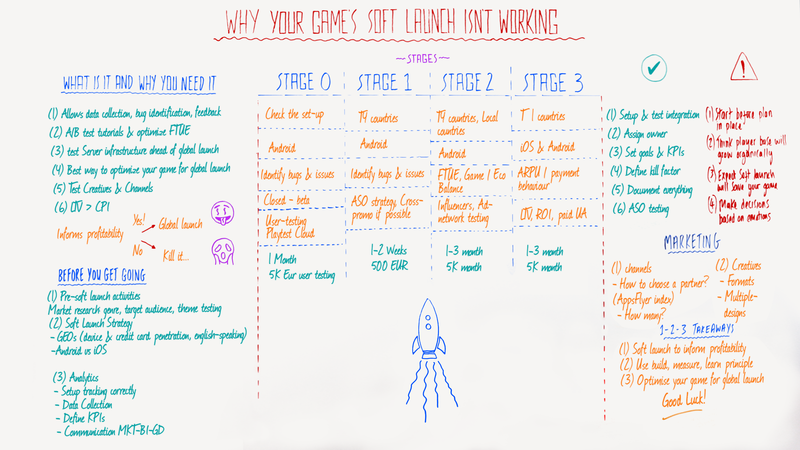 What are the stages of a gaming soft launch? Let’s move to the stages. I like to divide soft launch into three stages, and also, a Stage 0. In this stage, you only have the soft launch release candidate, but it’s a really great opportunity for getting early feedback from players, and identifying final bugs and issues. We use Playtest Cloud to get as many users testing the game as possible. That’s why we spend five thousand euros here. If you don’t have enough money, you can use your friends and family to get early feedback. If you are satisfied with Stage 0 results, then you can move to Stage 1. Here, we are adding Tier 4 countries, some of which are the Philippines, Vietnam, or Mexico because they have low CPIs, and we want to robustly test and identify bugs and issues. So we are getting the low CPIs. We don’t want to spend $2 just to test and identify bugs, right? Note that this is just a small, small test. It shouldn’t take more than one week. If you are satisfied with Stage 0 and Stage 1, let’s move to Stage 2. In this stage, we are adding in local countries. Since we are based in Slovakia, we added Slovakia and Czech Republic. At this point, we are measuring the first-time user experience and onboarding process, as well as the A/B test tutorials. The idea is, of course, to improve those metrics. In this stage, we also start testing multiple marketing channels. Then, let’s move to the Stage 3. In this stage, we are targeting Tier 1 countries, such as the U.K., Denmark, or the Netherlands. We are also adding iOS to the mix. The goal at this stage is to optimize average revenue per user and monetization metrics. So we are measuring lifetime value, return on investment, and focusing on paid user acquisition. What things should I do during the soft launch process? In general, there are a couple of things you should and you shouldn’t do during the soft launch process. First, you should set up and test integration and tracking. Second, you should verify that all SDKs are in place, media sources are configured, and the right events are set in your attribution partner. You should assign an owner to the soft launch process, whether it is a product guy or a marketing guy. In our company, it was me from the marketing team. This owner is responsible for all the processes that are happening in the soft launch, so you can talk with him and ask your questions accordingly. 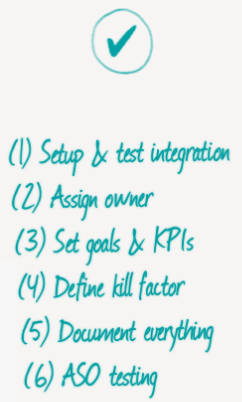 Third, you should set goals and KPIs. We recommend these include day one retention, day seven retention, and day 28 retention. Stick to those goals during the soft launch. Fourth, you should define your kill factor, so everybody knows why you might kill the game, or not. Fifth, you should document everything. We created a simple Excel sheet where we documented everything with all builds, as well as the change log, so that we were able to see which change made the biggest impact in each build. Sixth, you should perform consistent ASO. It’s really crucial to start with icon testing, screenshot testing, and an optimized feature image. You should test at least one of these elements in a soft launch. What things should I avoid during the soft launch process? There are a couple of things you shouldn’t do in a soft launch process. First, you shouldn’t start the soft launch before you have a plan because things tend to get messy. You should know what you are doing and how we are going to do it. Second, you can’t assume that your player base will grow organically and automatically. You need to use paid marketing and paid user acquisition to gather data, so you will be able to evaluate it properly. For example, Google recently changed its algorithms and lots of developers are complaining that they have seen a huge decrease of organic installs. Third, you can’t expect a soft launch to save your game because if your game’s metrics are not good enough, not even a soft launch can improve that. And finally, you shouldn’t make decisions based on emotions. If you are going to kill the game, it should be based on the data, not emotions. Not because you like it. What about marketing my soft launch? Here’s the last piece of the puzzle, the marketing. The soft launch process is the best time to test different marketing channels and marketing creatives. For example, we tested five different ad networks during the soft launch process, and we used AppsFlyer Performance Index to see which one we should test – we ended up going with three to the global launch. This is also the best time to test creatives and all formats available on Facebook. Through testing alone, we were able to decrease the CPIs from $3 to 50 cents. We tested static banners, square videos, portal videos, and all those things available on Facebook. In general, use soft launch to evaluate the profitability of your game, using the Build, Measure, Learn principle to iterate and improve your game as fast as possible. 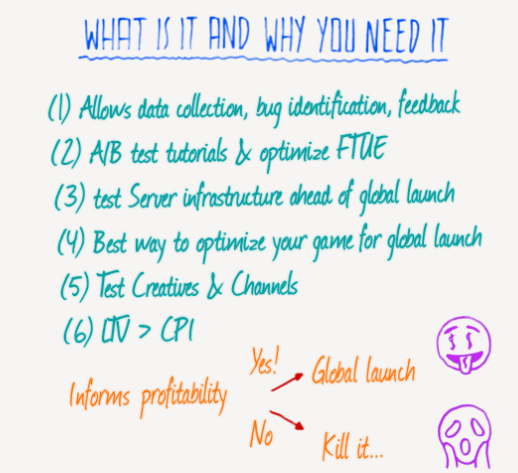 After all, soft launch is the best way to optimize your game for a global launch. So good luck. Thanks for watching, guys. If you have any tips or comments, please leave them in the comments section, and if you want to watch other MAMA Boards, use this link. Thank you.